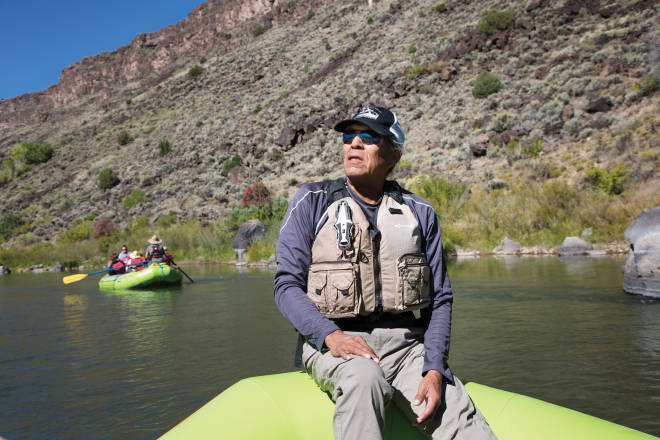 LOUIE HENA SITS AT THE HELM of our Native Cultures Feast and Float excursion as it drifts a long an easy stretch of water south of Taos. He looks at home—and he should. He’s spent the better part of three decades perched on inflatable bolsters as lead guid or oarsman. six-foot-long oars in each hand, navigating the Río Grande. With his signature sunglasses and ball cap pulled tight over a cascading salt-and-pepper ponytail, the expression on his 61-year-old face gives away little, though he’ll soon share some of what he knows about every current, the steep-walled canyon, the cottonwood saplings he planted along the banks, and the place where a boulder familiar in winter is now submerged as the water runs flush. He’s seen the river in every season. “Water and I are one,” he says. The Tesuque Pueblo member’s ancestors lived here long before his hands and oars dipped into the water. He spent childhood days fishing and camping with his parents along the sandy shores. In the 1980s, his passion turned professional as he joined his friend Cisco Guevara at Los Rios River Runners. Guevara had founded the Taos-based rafting company in 1978. 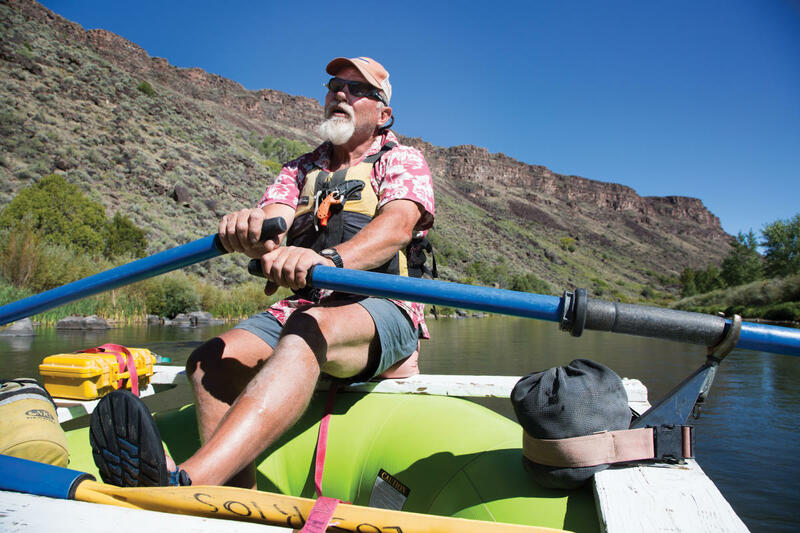 Back then, the two self-proclaimed “yahoos” sought out the big waves of the Taos Box and the Racecourse, legendary stretches of rapids along the northern stretches of the Río Grande. Today Hena, now a grandfather, keeps to more placid waters. Through the river’s flows of epic years and eking-by years, the places along its route have remained largely unchanged. Credit for that goes partly to a piece of landmark legislation hitting its 50th anniversary this year. I’ve joined this Native Cultures Feast and Float, which combines time on the water and the lore along its banks with a Pueblo-style feast at its end, for a unique way to appreciate the Río Grande. Hena and Guevara created the excursion in the early 1990s as a new way to get more people out on the water by explaining its deep cultural ties. But I’m also here to pay homage to the nation’s Wild and Scenic Rivers Act, which in 1968 included a healthy stretch of the Río Grande as one of the eight original waterways shielded from development. Far from empty bureaucratic lingo, the act has real impact for Hena and the Pueblo peoples who hunt, fish, forage, irrigate, and worship along these waters—as well as those of us who recreate here. Thanks to its safeguards—and Mother Nature’s blessings of rain and snow—Hena’s 13 grandchildren and, someday, their grandchildren will be able to run the river as he does now. On the heels of the 1964 Wilderness Act, which protected wildlands, the Wild and Scenic Rivers Act sheltered waterways with similar outstanding scenic, recreational, and cultural values. A designated “wild river” is inaccessible except by trail and has primitive shorelines and unpolluted water. A “scenic river” is similarly remote and undeveloped, though roads can reach its banks. The Río Grande has a total of about 68 miles in the two categories, adding up to a pristine experience along its northern reaches—from where it tumbles into New Mexico at the Colorado state line, through the 800-foot-deep chasm below the Río Grande Gorge Bridge, and churning into whitewater rapids, on to the Orilla Verde Recreation Area, about 12 miles south of the bridge. There the river widens and begins the rest of its languorous journey through the state to the Texas-Mexico border. Much of the wild and scenic mileage doubles as part of the Río Grande del Norte National Monument, nearly a quarter-million acres of rugged plains, volcanic cones, and steep canyons. Nationally, the Río Grande has few companions in its freewheeling ways. Of the three million river miles in the United States, fewer than 13,000 miles have either designation. Even in New Mexico, the Río Grande has little company; a total of just 57 other miles share the wild and scenic protections, including stretches along Ríos Jémez, Pecos, and Chama. Above: Rafters admire the beauty of the Río Grande. THE RÍO GRANDE MAY BE HENA’S OFFICE NOW, but it’s always been his church. “Earth Mom,” he says, “is sacred.” Its waters have remained pure enough that he submerges himself in them as part of his spiritual practice. The church walls are the canyon, which stretches up the hillside to the far peaks of the Sangre de Cristo Mountains in one direction and the top of the Jémez Mountains in the other. North toward the Río Grande’s headwaters, in Colorado’s San Juan Mountains, lies the altar, the source. In Hena’s church, “the music changes every second,” he says, as he listens for the calls of bald eagles, who are recovering here after near extinction, and the crash of reintroduced river otters through the willows. We hear the pulse of rippling water, and Hena advises us to watch for Avanyu, a water serpent and powerful deity to Pueblo peoples. It is revered as the water guardian, the carrier of energy as it flows from the sky, through the river’s muddy, churning waters, onto farm fields, and into the bodies of those who touch it. Avanyu shows itself in the waves, each one a curved spine flowing downstream with us. For Puebloans, Avanyu represents but one element of the spirituality of water. In this place, where the average rainfall is only 11 inches a year, the perpetual prayer is for water—enough to leave the land soaked, the rivers flush, and the people sated. Where some may see scarcity, Pueblo people see abundance. “We’re groundwater specialists,” Hena says as he gestures to the evidence of water’s path as it flows from the mesa tops down the canyon walls. Verdant patches of cottonwoods spring up among the surrounding sage and juniper, trumpeting the presence of just enough water near the ground’s surface. That same water continues downriver to feed crops. Hena’s plot is at his home pueblo, some 50 miles south of here. The kinds of traditional crops he tends are on our minds as our rafts skid onto the sandy pullouts at the Orilla Verde Recreation Area. There, Hena’s wife, Serena, a daughter, and a granddaughter await with a traditional feast-day meal. We pile our plates with red chile stew, blue corn posole, calabacitas, and oven bread. From chopping wood to tending horno fires to baking Indian pies for dessert, Hena’s whole family plays a part in the outings. MONTHS LATER, WHEN RAFTING weather has given way to winter, Hena, Guevara, and I gather in the same structure where we once lunched. We huddle close to a campfire and sip blue corn atole to warm ourselves. Hena describes how these waters and hillsides are his pantry. He, along with several other Puebloans, switched to a pre-European-contact diet with foods their ancestors likely harvested here: fish from the river; piñon, chokecherry, and cactus blossoms foraged from the hillsides; corn, beans, squash, and other harvests from their fields. His friend Roxanne Swentzell, the Santa Clara Pueblo artist, chronicled their experiment in The Pueblo Food Experience Cookbook. The weight just fell off, Hena says, and aches that had troubled his aging bones disappeared. He giggles as he recalls the group’s gatherings to compare their weight loss, clothes dripping off their smaller frames. Concerns about the river’s health have heightened this summer, after a remarkably dry winter. Releases from dams and reservoirs will attempt to keep the river’s northern reaches flowing, in part to protect endangered species like the Río Grande silvery minnow and help farmers irrigate, but water levels are likely to remain especially low. There may not be big water farther north, but the stretch that the Native Cultures Feast and Float navigates will continue to amble along. Of course, conditions can change dramatically with one storm. Scientists and outfitters are looking to the promise of the monsoons to keep the river flowing. Above: John Harvey pulls rafters along the Río Grande. As a member of the Traditional Native American Farmers Association, Hena teaches permaculture and indigenous agricultural practices to Native youth. “We want our young people to know who they are,” he says. The teachings take place during summer workshops at the Camino de Paz School and Farm, in Santa Cruz, and along the terraced walls of these river canyons. There, students learn to forage native plants and repopulate them by burying seed balls. As we depart, Hena and I drive a bit farther north to a circle of stones marked with petroglyphs, which Hena considers his altar. Along the way, we spot a bald eagle perched on a ponderosa snag. It’s one of two, a mating pair, that call this stretch of canyon home. Hena rolls down the SUV’s window and calls out a Tewa greeting. The eagle turns its head in our direction but doesn’t stir. Perhaps it recognizes a friend and fellow spirit. Hena parks and scrambles up the hillside to say his private prayers. I wait in the car. As I gaze at the view, another eagle glides on canyon uplifts. Its wings wide, it soars and corkscrews as though it’s floating on Earth Mom’s breath. Spiral on, Hena would say. Spiral on. Offered March through November, based on demand, the Native Cultures Feast and Float is a gentle trip with two guides. One rows while a Native American (Hena, his children, or friends from neighboring pueblos) shares Puebloan history and lore. After the hour-and-a-half float, participants disembark for a traditional feast-day meal. Los Rios also offers a full slate of half- and full-day trips along the Río Grande, through the Taos Box, Racecourse, and Lower Gorge sections. Additional trips explore the Río Chama and can be extended to multiday adventures. Trips start at $54 (575-776-8854, losriosriverrunners.com). 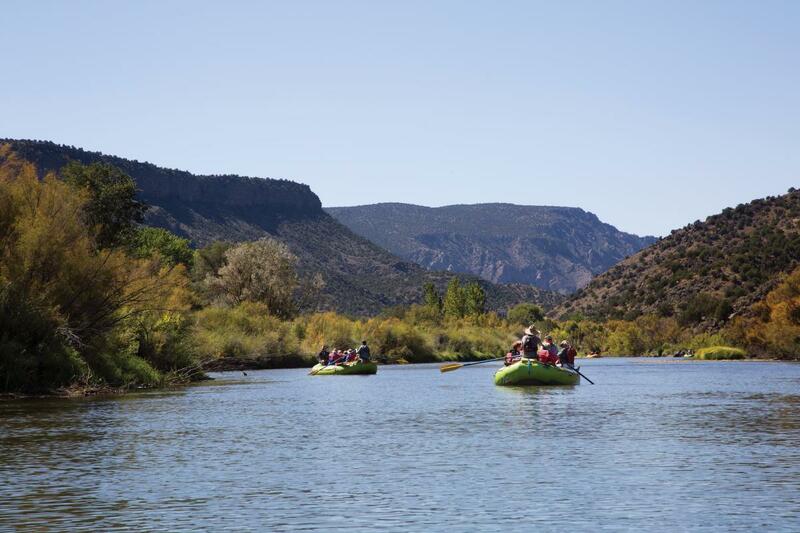 Combine mountain biking and rafting on trips through thrilling sections of the Río Grande, like the Racecourse and Taos Box, plus paddleboarding and “funyaking” in single-person inflatable kayaks (575-758-2822, cottamsriogranderafting.com). This longtime outfitter offers full-day adventures along the Río Grande that add horseback riding, fishing, and rock climbing to paddling. More laid-back versions blend soaking in hot springs with rafting. Multiday excursions along the Río Grande and Río Chama include riverside tunes from local musicians and yoga classes (800-359-2627, farflung.com). This environmentally minded outfitter launches adventurous half-day to multiday trips on the Río Grande and Río Chama (505-983-3734, kokopelliraft.com). Choose your own adventure with whitewater classes, rafting, paddleboarding, and climbing adventures suitable for the whole family. Some trips include beer or wine tastings (800-983-7756, newmexicoriveradventures.com). Ride wild waves on the upper stretches of the Río Grande or take the kids on a scenic lunch float near the Orilla Verde Recreation Area (800-984-1444, newwaverafting.com).